Information security firm High-Tech Bridge has conducted a study of SSL VPNs (Virtual Private Networks) and discovered that nine out of ten such servers don’t provide the security they should be offering, mainly because they are using insecure or outdated encryption. An SSL VPN is different from a classic IPSec VPN because it can be used inside a standard Web browser without needing to install specific software on the client-side. SSL VPNs are installed on servers, and clients connect to the VPN via their browsers alone. This connection between the user’s browser and the VPN server is encrypted with the SSL or TLS protocol. Researchers from High-Tech Bridge say they analyzed 10,436 randomly selected SSL VPN servers and they found that most of them are extremely insecure. They claim that 77% of all SSL VPNs use SSLv3 or SSLv2 to encrypt traffic. Both of these two versions of the SSL protocol are considered insecure today. These protocols are so insecure that international and national security standards, such as the PCI DSS and NIST SP 800-52 guidelines, have even gone as far as to prohibit their usage. Regardless of their SSL version, 76% of all SSL VPN servers also used untrusted SSL certificates. These are SSL certificates that the server has not confirmed, and that attackers can mimic and thus launch MitM (Man-in-the-Middle) attacks on unsuspecting users. High-Tech Bridge experts say that most of these untrusted certificates are because many SSL VPNs come with default pre-installed certificates that are rarely updated. Additionally, researchers also note that 74% of certificates are signed with SHA-1 signatures, and 5% with MD5 hashes, both considered outdated. 41% of all SSL VPNs also used insecure 1024 key lengths for their RSA certificates, even if, for the past years, any RSA key length below 2048 was considered to be highly insecure. Even worse, one in ten SSL VPNs is still vulnerable to the two-year-old Heartbleed vulnerability, despite patches being available. 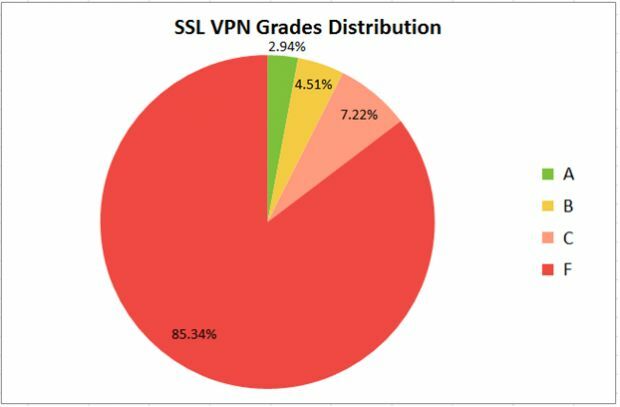 Out of all the tested SSL VPNs, researchers say that only 3% followed PCI DSS requirements. None managed to comply with NIST (National Institute of Standards and Technology) guidelines. High-Tech Bridge is also providing a free tool that can tell users if their SSL VPN or HTTPS website is actually doing a good job of protecting them. For the original story follow this link to Softpedia for more information.